As the days get longer and longer, the birds’ urge to nest gets stronger and stronger. You can provide housing for the birds to help them accomplish their nesting goals. The main ways to help birds are to provide nest boxes, nest shelves and nesting material. Providing food and water for the birds also makes your yard a more attractive nesting location. 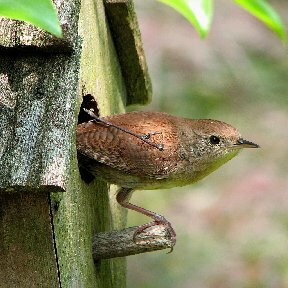 Many birds nest in tree captivities, so a nest box is essentially providing them the same living habitat. That’s why placing a nesting box on a tree trunk is often the way to mount a box. Species that use nest boxes in Mid- Missouri include: Wood Duck, American kestrel, Screech Owl, Woodpeckers, Tree Swallows, chickadee, Titmouse, Nuthatch, Wren, Bluebird and Finch. We have nest boxes that are the shape and size appropriate for each species. They are made of natural cedar or durable recycled composite plastic. These houses have thick walls to insulate from heat and cold. Drainage holes allow for moisture to drain through and ventilation slots provide for air flow. They also have a swing door for easy cleaning. Portal protectors are metal rings that can be attached to the nest box opening that will prevent larger birds from pecking a bigger hole and predators from gnawing into the box. Nesting material that is preferred by birds is: feathers, string, cotton, hemp, dog hair, and fibers. This mixture will attract many more birds than cotton alone. Present nesting material to birds by hanging it in suet cages. This material will benefit all nesting birds. There is a unique blend of materials for hummingbirds that comes in a hanging cage and is the only nest material proven to be used by hummers and is endorsed and recommended by the Hummingbird Society. Spring will bring Bats to our area as well, so consider a bat house. They will help to control Mosquitoes in your yard during the warmer months. Bats seem to prefer a house that is weathered; so now is not too early to put one out. They can easily be mounted on the side of a building or a tree trunk. Come to Hillermann Nursery & Florist and check out our supply.